Use the Snowflake Data Connector to import data stored in Snowflake tables into Arm Treasure Data. 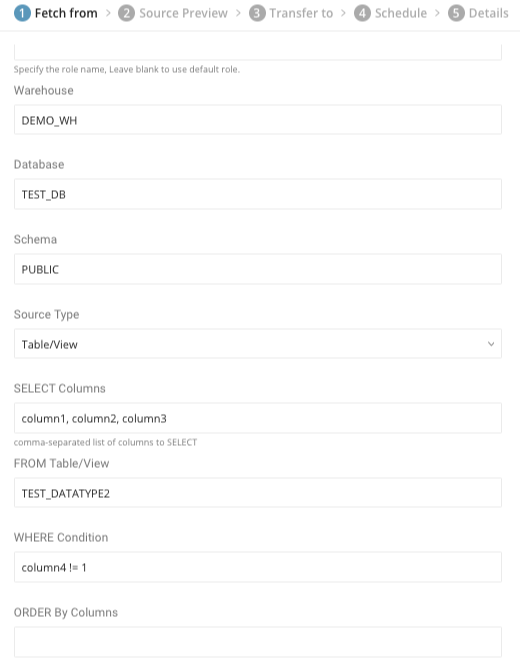 An existing account of Snowflake data warehouse with appropriate permissions to query tables/views. 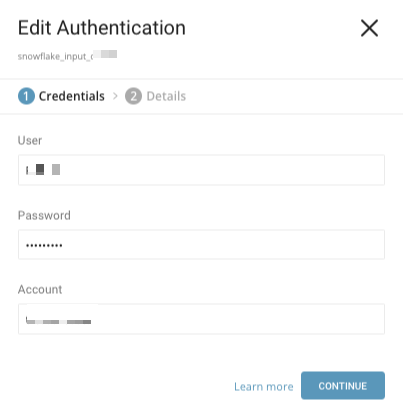 Provide the required credentials: User, Password, and Account to authenticate Treasure Data to Snowflake. Specify a name for your data connector. Indicate if you want share the authentication with others. If you share, other team members can use your authentication to create a connector source. Click Done. 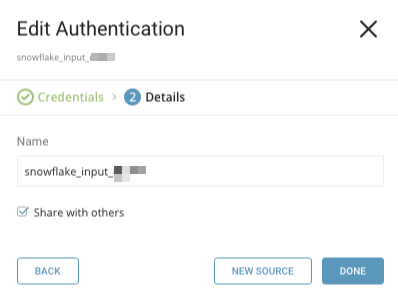 Create a New Source on the Authentications page. Role Name: Specifies the default access control role to use in the Snowflake. Leave empty to use the default Role. Warehouse: required. Specifies the virtual warehouse to use. Schema: required. Specifies the default schema to use for the specified database when connected. SELECT Query: the Raw SQL query to run. Allows SELECT type query only. INSERT, UPDATE or modifying data are not allowed. SELECT Columns: required. Expression of select. Accepts comma-separated column names or `*` to select all columns from Table/View. From Table/View: required. Destination table name. Incremental Column(s): Column names for incremental loading. Allows Timestamp and Numeric columns. If not specified, the Primary column (if exists) is used. ORDER By Columns: Not allowed when Incremental Loading is selected. Invalid Value Handling Mode: When your table contains invalid data in a row, there are options to Fail Job, Ignore Invalid Value or Ignore Row. When Fail Job selected, the current job stops and gives a status ERROR. When Ignore Invalid Value selected, saves a Null value if the TD table's column isn't a type of string, or tries to save the value as a string if the column is a string column. When Ignore Row selected, ignores the row contains the invalid value and keep running. Default if not specified, Fail Job is selected. The specified Warehouse, Database, and Schema must already exist. The specified Role must have privileges to the specified warehouse, database, and schema. Click Next you’ll see a preview of your data. Preview might show dummy data if a query takes a long time to finish, such as when you use a heavy query. For example: querying a large table that contains an Order By column but is not indexed. When you use a complex query with multiple conditions, joining tables, sometimes Preview shows "No records to preview" but it won't affect the Job result. Read more information about Previews. To make changes, such as set data type mapping, click Advanced Settings otherwise, click Next. Advanced Settings allow you to customize the Transfer. Edit the following section, if needed. Get as Type: Get data from source as this specified type. Destination Data Type: The expected destination data type. Start After (values): When Incremental Loading is selected and you specify this value, only data that greater than this value is imported. The size and order of this field must be equal to Incremental Columns. Rows per Batch: Number of rows to fetch one time, default 10000 rows. Network Timeout: Specifies how long to wait for a response when interacting with the Snowflake service before returning an error. Query Timeout: Specifies how long to wait for a query to complete before returning an error. Zero (0) indicates to wait indefinitely. Choose an existing or create a new database and table that you want to import to. Mode: Append or Replace. Select whether to append records to an existing table or replace your existing table. You can specify a one-time transfer, or you can schedule an automated recurring transfer. Schedule: Options: @hourly, @daily, @monthly, and custom cron. Provide a name for your Snowflake connector, as a new source. Click Done. Your data connector is saved as a Source. On this page, you can edit your existing jobs. You can also view the details of previous transfers using this data connector by clicking the jobs icon. The in: section is where you specify what comes into the connector from Snowflake and the out: section is where you specify what the connector puts out to the database in Treasure Data. network_timeout integer no how long to wait for a response when interacting with the Snowflake service before returning an error. Default not set. select string no expression of select. Required when 'query' is not set. table string no destination table name. Required when 'query' is not set. value_type string no use with column_options, attempt to get data from Snowflake JDBC driver using this type. Submit the load job. It may take a couple of hours depending on the size of the data. You must specify the database and table where their data is stored. 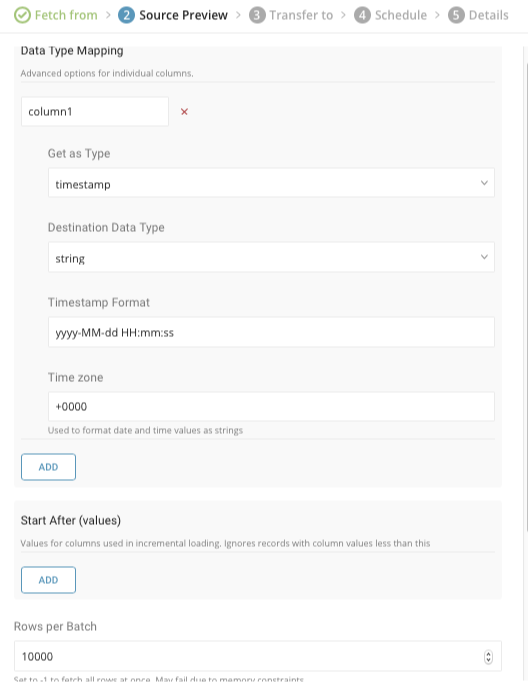 It is recommended to specify the --time-column option because Treasure Data’s storage is partitioned by time. If the option is not given, the data connector selects the first long or timestamp column as the partitioning time. The type of the column specified by --time-column must be either of long or timestamp type. td connector:issue assumes you have already created a database(td_sample_db) and table(td_sample_table). If the database or the table do not exist in TD, td connector:issue will fail. Therefore you must create the database and table manually or use --auto-create-table option with td connector:issue command to automatically create the database and table. You can schedule periodic data connector execution for periodic Snowflake import. td connector:history shows the execution history of a schedule entry. To investigate the results of each run, use td job <jobid>. A data type conversion, also called Column type mapping or column_options uses by the Connector to convert data from Source data type (Snowflake) to Destination (type) data type (Arm Treasure Data). The Connector will Get as type (value_type) from Source and then performs conversion to Destination. The table is the default conversion. Get as Type date, time and timestamp and Destination as a string will have additional options to format the value. Get as Type 'decimal' type is supported but not used by default. If the Source contains a numeric value that doesn't fit the range of the Destination numeric value, use Get as Type decimal and Destination is a string. Only Timestamp, Datetime and numerical columns are supported as incremental_columns. If incremental: false is set, the data connector fetches all the records of the specified Snowflake Table/View, regardless of when they were last updated. This mode is best combined with writing data into a destination table using ‘replace’ mode.